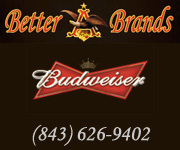 The Dunes Golf & Beach Club has been named the Myrtle Beach Area Golf Course Owners Association’s 2012 Course of the Year. Significant contribution to the game. By virtue of winning the award, Dunes Club becomes a candidate for state and potentially national honors. 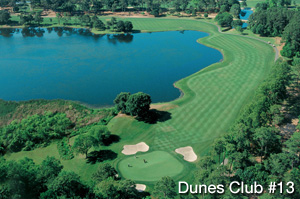 The award is another in a long list of accolades for the Dunes Club. Golf Digest, Golf Magazine and Golfweek have long ranked the Robert Trent Jones, Sr. design among America’s top 100 public courses. 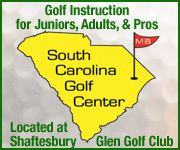 The Grand Strand’s second oldest layout, the Dunes Club has also hosted some of golf’s most prestigious events, including the U.S. Women’s Open, six Senior PGA Tour Championships, and the finals of the PGA Tour’s Q-School. The course has also hosted the final round of the World Amateur Handicap Championship on several occasions. The 13th hole, known as Waterloo, is the Dunes Club’s signature hole and the memorable crescendo of a three-hole stretch known as Alligator Alley. The par 5, which plays around Lake Singleton, has been featured on the pages of Golf Digest and hailed by the likes of World Golf Hall of Famer Dan Jenkins. The 11th and 12th holes, both of which play along the swash from the nearby Atlantic Ocean, complete Alligator Alley, one of the finest stretches of golf in the nation. 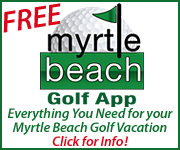 The Dunes Club opened in 1949 and gave Myrtle Beach national cache as the area grew into America’s most popular golf destination, but the course’s value to the Grand Strand extends beyond national recognition. The Dunes Club has been a bedrock of the community since its opening, hosting countless charity events and junior golf outings. 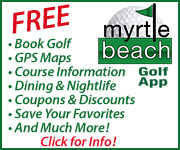 The course also serves as the home course for the boys and girls golf teams at Myrtle Beach High School. At the heart of the course’s engagement with the community are its ownership and a thriving membership.